Berlin has made new laws for people who want to circumcise their sons – and traditional Jewish mohels don't meet criteria. Berlin's top justice official, Thomas Heilmann, said the new rules are intended to protect the rights of Jewish and Muslim parents. There are more than 200,000 Jews and at least four million Muslims living in Germany at present. “We explicitly welcome Muslim and Jewish life in Berlin,” Heilmann said. “That is only possible if freedom to practice religion is possible.” But that freedom is only being granted under certain conditions, he added. The practice must be carried out only by doctors, according to a “medically professional standard,” including a sterile environment, as little pain as possible, and care to stop bleeding. Heilmann said the parents' statement could come in the form of a written declaration either from the parents themselves or their religious congregation, and that the procedure did not necessarily have to take place at a hospital. 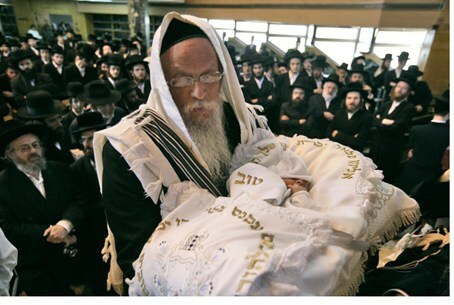 However, he added that Jewish mohels who traditionally perform the brit milah circumcision ceremony on the eighth day of a boy's life lack the necessary medical training, and therefore are prohibited from carrying out the procedure. The policy will apply until the German parliament passes legislation on the issue, subsequent to recommendations made last month by a parliamentary ethics committee. Berlin Jewish Hospital medical director Kristof Graf was quoted by the AFP news agency as saying he was “satisfied with the solution” advanced by Heilmann. Graf noted there have been no circumcisions in his medical center since June – despite the fact that in an average year, the hospital performs 80 to 100 of the procedures.